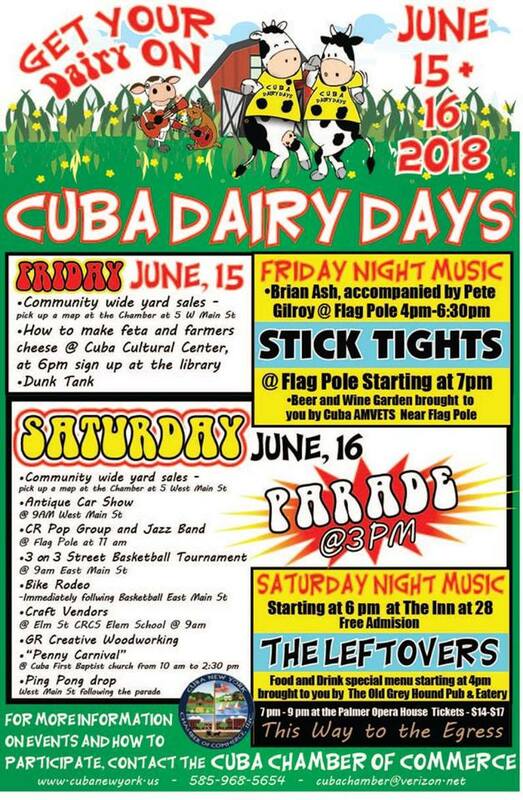 The Cuba Chamber of Commerce will be hosting their annual Dairy Days on Friday and Saturday, June 15th & 16th. The festival features two days worth of fun, music, competitions, and more! Both Friday and Saturday will have community-wide yard sales. Pick up a map at the Cuba Chamber of Commerce at 5 W Main St. Music on Friday starts at 4pm by the flagpole on Main St with Brian Ash w/ Pete Gilroy from 4-6:30pm and Sticktights at 7pm. The festivities on Saturday kick off at 9am with an antique car show on West Main St along with the 3 on 3 Street Basketball Tournament on East Main and craft vendors on Elm. The afternoon events include a Bike Rodeo starting after the conclusion of the basketball tournament and the annual Cuba Dairy Days Parade at 3pm. Live entertainment on Saturday starts at 11am with the CR Pop Group and Jazz Band at the flag pole. The Inn at 28 will feature The Leftovers starting at 6pm (free admission.) This Way to the Egress will perform at the Palmer Opera House starting at 7pm with tickets starting at $14. 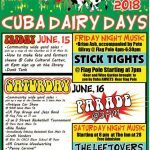 Registration for the Parade, 3 on 3 Basketball Tournament, Craft Show, Yard Sales, and Car Show can all be found at the official Cuba Dairy Day’s webpage.